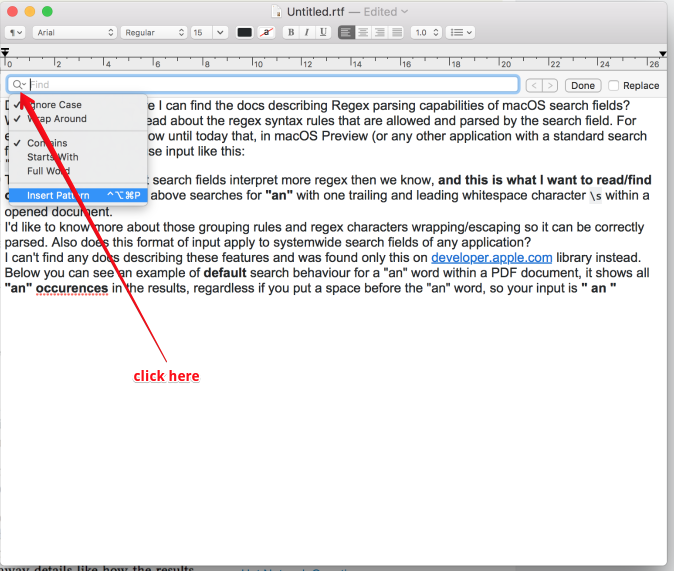 Does anyone know where I can find the docs describing Regex parsing capabilities of macOS search fields? "\s" AND "an" AND "\s"
This works and hints that search fields interpret more regex then we know, and this is what I want to read/find out about. The example above searches for "an" with one trailing and leading whitespace character \s within a opened document. I'd like to know more about those grouping rules and regex characters wrapping/escaping so it can be correctly parsed. Also does this format of input apply to systemwide search fields of any application? I can't find any docs describing these features and was found only this on developer.apple.com library instead. Below you can see an example of default search behaviour for a "an" word within a PDF document, it shows all "an" occurences in the results, regardless if you put a space before the "an" word, so your input is " an "
This makes a huge difference for searches containing common words! In short: I'd like to know more about the functionality you see above. Where can I find any (official) documentation about it? The answers provided (so far) are not answering my question, thank you for them though - aggregating more related information is good. This is basically user-friendly regex, i.e. you get tokens you can easily arrange into quite powerful search patterns. 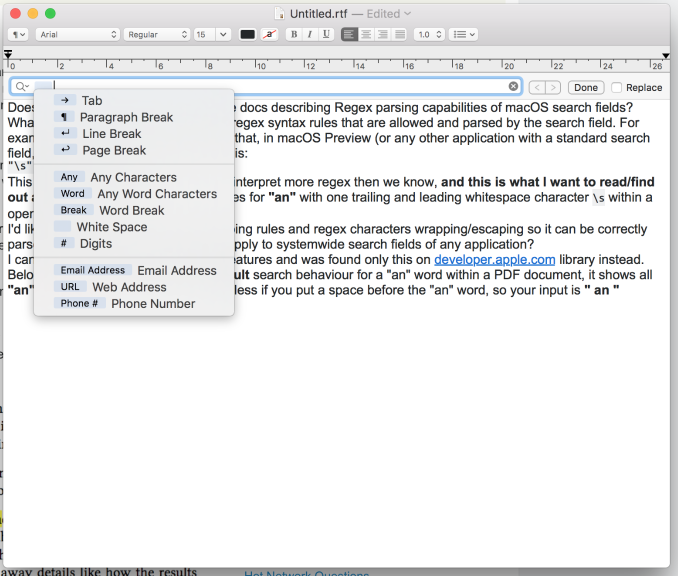 The example in the screenshot is TextEdit however this option doesn't appear to be available in Preview. Not the answer you're looking for? Browse other questions tagged macos search text-input command-line . Using a keyword that contains a space in a Spotlight search? What does “Enable Quick Website Search” do on OS X?